Ever wonder why Oklahoma has a panhandle and Missouri has a bootheel, or why Colorado and Wyoming are just boring rectangles? Also, what’s up with that big part of Michigan that clearly looks like it should belong to Wisconsin? During the expansion of the United States, one of the main objectives of congress was to create states of equal status and power, so how did everything turn out looking so random and uneven? ~ The Missouri/Iowa border is not straight, but curves slightly upward toward its eastern end because of a surveying error that was never corrected. ~ Texas has a provision stating that it has the right to break into 5 separate states if it should choose. ~ The original Carolina Colony stretched in theory from the Atlantic to the Pacific (though at the time they weren’t entirely aware of how far that was). ~ Both Minnesota (Northwest Angle) and Washington (Point Roberts) have tiny bits that are connected directly to Canada but not to the United States by land at all. And my personal favorite ~ A judge, bitter at his appointment to an outlying area in the Idaho Territory, traveled to Washington, DC carrying $2,000 in gold and “somehow” shifted the proposed state border in Montana’s favor. A helpful section titled “Don’t skip this, you’ll just have to come back later” gets things started by explaining some major milestones like the French and Indian War and the Louisiana Purchase that determined future state boundaries. It also describes the thought process behind everything going all rectangular out West and reveals the lasting lines drawn by slavery. All 50 states and the District of Columbia are covered in alphabetical order. The alphabetical organization is handy for when you want to quickly find one state, but since neighboring states are not next to each other alphabetically, I found myself frequently flipping back and forth to make sense of it chronologically. Each chapter contains several reference maps, but it’s still nice to keep an atlas open for an overview. It’s a great general historical/geographic reference book to have. We also used the book as a time-killer while passing through 12 states on our Eastern US and Canada road trip in 2010, reading chapters aloud after entering each new state. We’re cool like that. To answer one of the questions from the first paragraph: Michigan was given its Upper Peninsula (and Isle Royale) as compensation for losing a border battle with its southern neighbor that resulted in Toledo becoming part of Ohio. The people of the future Wisconsin were not happy. Minnesota’s Northwest Angle, Missouri’s bootheel and Oklahoma’s panhandle. Weird. 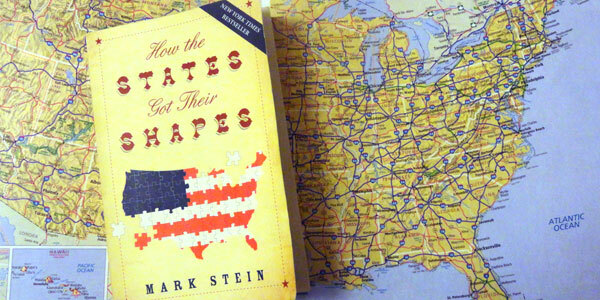 This entry was posted in Maps, Travel Resources and tagged How The States Got Their Shapes, Mark Stein, Road trip reading, State borders. Bookmark the permalink.